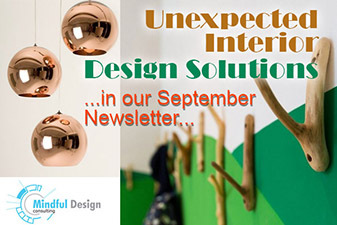 This is our Commercial Interior Design September 2014 newsletter! Today I will share a few fresh design solutions for your typical businesses. You can find this and other interesting design ideas on our Blog. In our Green News corner, learn about the future of solar technology and how glass towers could soon become giant transparent solar cells. If you missed it, read our February newsletter showcasing some Trends in Commercial Interior Design of 2014. You may also see your store here if you are our client! 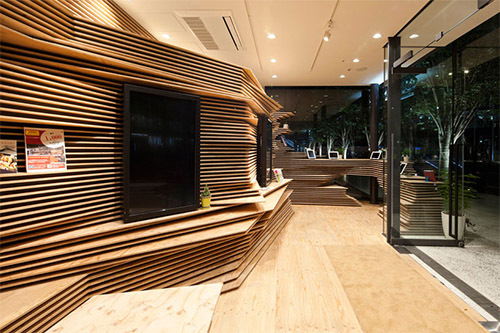 For interior design concept of a cafe, there is no better place than Shun-Shoku Lounge which is composed of piles of plywood sheets. This whimsical interior creates a topography that looks like rare Japanese art meets coffeehouse with relaxed seating. On the wooden surfaces you are served food and drinks. What more can you ask for? See more images of this unique cafe look HERE. Bank Interior or a Cafe Lounge? 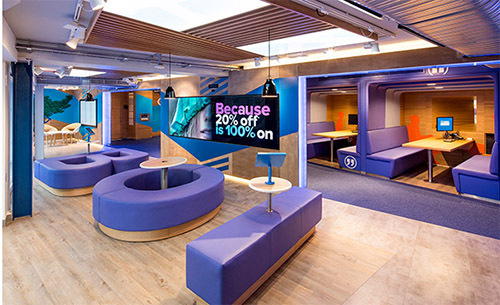 For its cozy branch at DCU, the Bank of Ireland settled on a cyan and lavender color scheme that derives from its corporate branding colors. Although the Bank of Ireland conjures an image of conservative and stately history, the DCU branch has a style that is young, modern and inviting. Touchscreens, banners and decorations that resemble computer icons seem to float in the air in this branch. Comfortable booths are ready for your next bank transaction. See more images of this inviting bank HERE. Reframing public perception of a dollar store is not an easy task for an interior designer. Dollar store graphics have typically signified cheap quality with their chosen logos. Their logos have relied on a comical tone presented in a cartoonish image. This signals to shoppers a nod and a wink that they can expect to find cheap imitations instead of quality items. 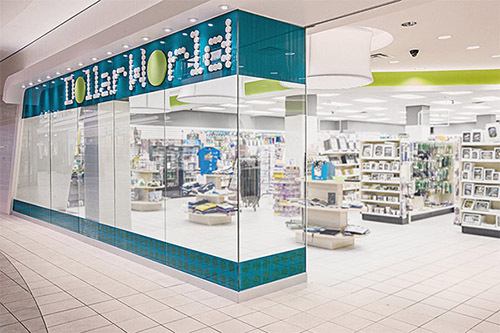 By tweaking the two dimensional presence the designer helped Dollarworld tell customers that they are held in high esteem despite low prices. See more images of this beautiful interior store design and brand HERE. 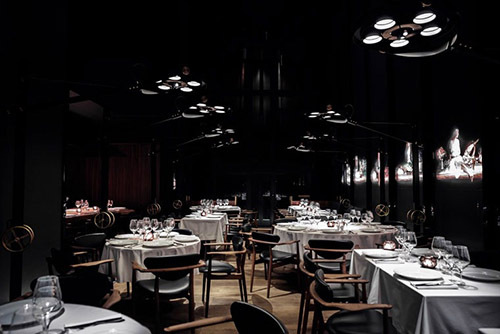 Dark, but perfectly balanced, the interior design of La Centrale Restaurant in Lebanon leaves guests hungry for high-end cuisine. Bright, almost surgical, light fixtures pointing onto contrasting white tablecloths dramatically emphasize the crispness of the space. See more images of this sophisticated restaurant HERE. School interior design is not known for being especially innovative, fun, or anything interesting to look at. 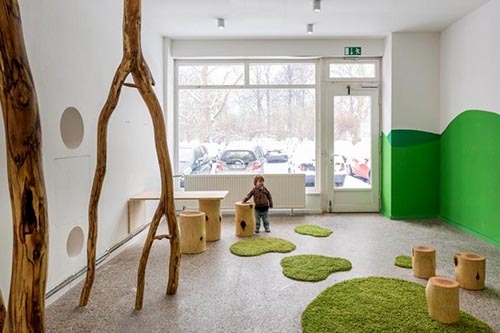 Baukind’s daycare interior design is a different story! Its rooms include not only textured walls and speckled ceilings made to look like cave interiors, but also curving and playful arched doorways and hanging lamps in shapes of sea shells or bird nests. The theme clearly is nature with earthy tones of green, brown, and cream white. As if that’s not exciting enough, you can crawl realistic trees inside the room, sit on wooden storage cubbies, and lie down on floors. There are green fuzzy floor mats that look like life moss. See more images of this creative and inspiring school interior design HERE. 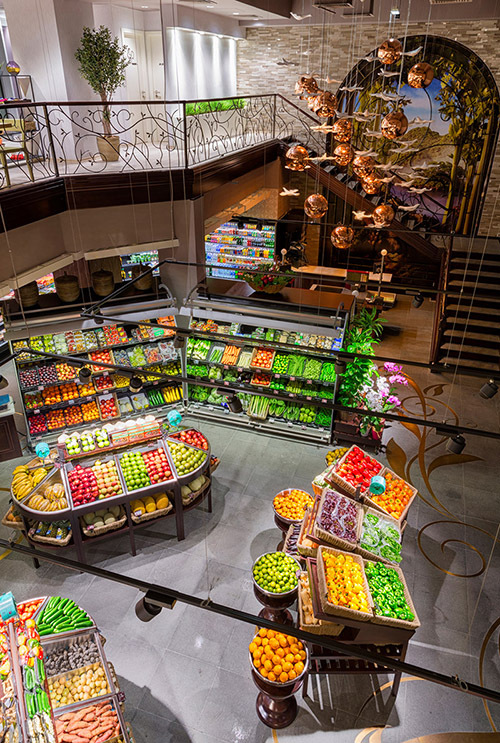 Located in the United Arab Emirates, Maybury is a gourmet lovers dream with its supermarket, café, delicatessen and informative cooking school. Designers on the project wanted to create a store design where customers would feel at home and want to return often. The interior designer wanted guests to have a new experience each time they climbed the staircase with the metal banisters. Maybury is a beautifully designed haven for foodies. See more images of this amazing grocery store HERE. In the cities, with taller buildings, the amount of roof available per square foot of area goes way down. 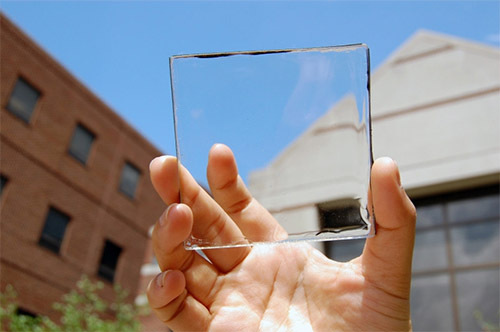 That's why this new solar collector developed at the University of Michigan is so interesting: It is totally transparent and can be built into windows. Read more about this story HERE.